Local Yarn Store Day is a brick-and-mortar yarn shop appreciation day created by TNNA Yarn Group exclusively for TNNA members. The inaugural LYS Day took place on April 21, 2018, and was designed to show support for small businesses while bringing together a unique community of knitters, crocheters, weavers and spinners to drive awareness and celebrate the craft. This year's LYS Day will take place April 27, 2019. Join us for a fun day of celebration! 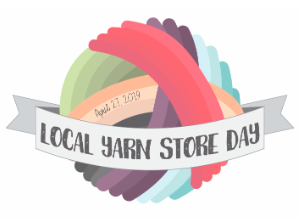 Bring your latest project and spend the day, we can't wait to see you, and we have a few exclusive items for LYS day that we are excited to share!